Clean puffed rice for any dirt & stones, keep aside. Note: If puffed rice is not crisp dry fry on pan till crisp. Don’t roast. Deep fry groundnuts, roasted gram, garlic & dry coconut separately till golden brown colour. Deep fry curry leaves till crisp. Keep aside. Heat the 2tsp oil in a pan. Add mustard seeds & let it splutter. Add Red Chilly, roast it. Add chilly powder, turmeric powder & salt, mix well. Add all the Deep fried ingredients & mix. In mixing bowl add puffed rice & all fried ingredients, mix well. Masala Puffed rice is ready to serve as a snack. I wont bother to munch some masala puffed rice ,yumm..truly tempting..
lovely murmure snack for tea time .. Delicious evening snack. Love them to munch on. 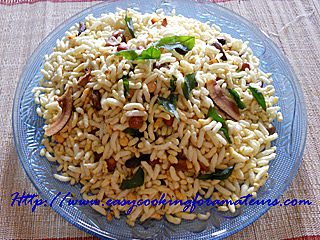 I am a big fan of puffed rice .. looks so yummy. Perfect time pass snack.. looks gr8 !! oh my...wat a tasty treat..
perfect tea time snack!...I enjoy is spicy!